Elevate your training session with the 6" padded belt from Harbinger. The belt ensures reliable core support and with an interior foam padded your ensured comfort. Check out the product video in the media tab. 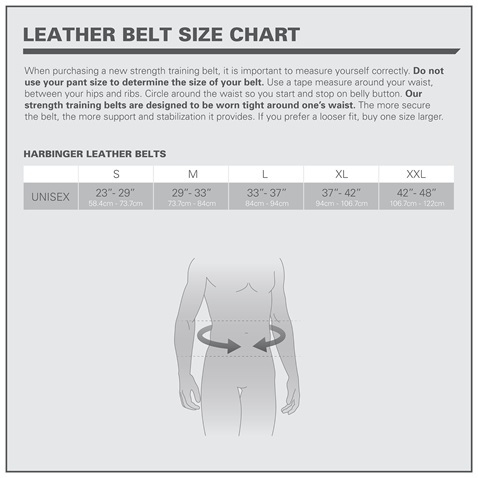 When purchasing a new strength training belt, it is important to measure yourself corrrectly. Do not use your pant size to determine the size of your belt. Use a tape to measure around your waist, between your hips and ribes. Circle around teh waist so you start and stop on the belly button. Our strength training belts are designed to be worn tight around the waist. The more secure the belt, the more support and stabilisation it provides. if you prefer a looser fit, buy one size larger.